Hello and welcome to the 137th installment of the SWD. Syrian Democratic Forces captured several localities from the Islamic State south of Raqqa, including the village of Qusra Afan. After these advances which resulted in at least four IS’ casualties, SDF has completely besieged the city of Raqqa. Islamic State’s SVBIED targeted the gathering of SDF‘s fighters in Al-Mashalab district, while in Al-Barazi roundabout’s area, IS claimed to have killed two SDF‘s fighters and wounded three more. Explosive device exploded on the road in the vicinity of Saraqib, causing no casualties. Syrian Arab Army and allies captured Humaymah area from Islamic State. SAA is now around 30 kilometers (~18.6 miles) away from T2 airport & pumping station. Amaq released a statement reporting death of three SAA‘s soldiers and injury of several others due to clashes with Islamic State, east of Arak. Syrian Arab Army made advances on Ain Terma front, by capturing Ain Terma junction and several building blocks in the vicinity. Today’s attack was supported by three surface-to-surface missiles that targeted Ain Terma. According to rebel sources, SAA lost three officers and an armored bulldozer during today’s clashes around Ain Terma. Several civilians were injured by SAA‘s artillery shelling of Douma city, part of the shells fell on the residential areas in the city. Rebels reportedly infiltrated a building at the outskirts of SAA-held Al-Sijnah district, rebels took control of positions in the building and killed six fighters of IRGC-backed Afghan militia, Liwa al-Fatemiyoun. Iraqi forces made important advances in the Old Mosul district by capturing the remains of the symbolic Great Mosque of Al-Nuri and its famous leaning minaret, Al-Hadba. 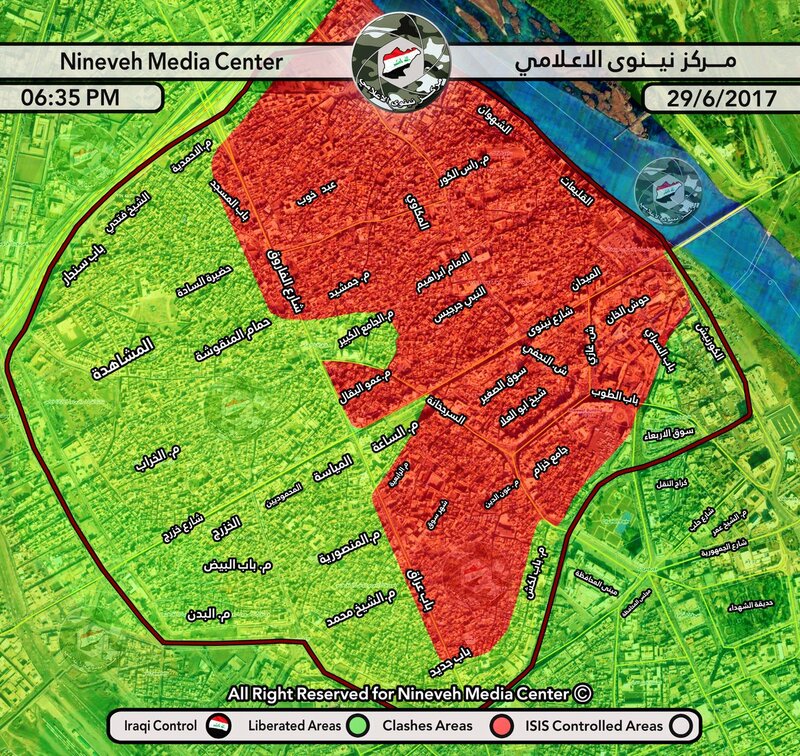 Other localities captured during today’s advances in west Mosul include: Mosul Medical College, an orphanage, Dental College, Al-Batul hospital, and the entire Jumhori hospital complex. Islamic State’s days are numbered in west Mosul, the city is expected to be under the full control of Iraqi forces in a couple of days, unless something unexpected happens. Amaq’s daily statements from west Mosul claimed death of seven Iraqi troops due to Islamic State’s snipers in Al-Mashahedah neighborhood. Islamic State reportedly launched an attack against the Iraqi forces’ positions in Bab al-Bayd and Bab Jadid, killing nine Iraqi soldiers. In east Mosul, Iraqi security forces foiled an IS sleeper cell planning an attack in the city. Five explosive belts were found in Al-Baladiyat district and three IS’ members arrested in Al-Nabi Younis district, locals of Mosul assisted the security forces with information about IS’ members. Fronts around Tal Afar reignited again, east of Tal Afar, IS’ inghimasi (suicide fighters) attack was repelled on the village of Abu Kadour. Amaq reported IS’ snipers killed five Al-Hashd al-Shaabi’s (Popular Mobilization Units) fighters at the outskirts of Tal Afar airport and Al-Mahlibia village. Islamic State launched a raid against Al-Hashd al-Shaabi’s positions in Al-Khannuka village, allegedly killing eight fighters. Iraqi security forces seized and safely defused a VBIED in Al-Sadr district, central Baghdad. On the 28th of June 2017 CJTF-OIR has conducted 20 strikes in Syria. CJTF-OIR‘s main focus in Syria at the moment is Raqqa region where they did 13 strikes supporting SDF‘s operations against IS destroying 10 fighting positions, two vehicles, a UAS, and suppressing an IS tactical unit. Other areas where seven airstrikes occurred are Abu Kamal (Al-Bukamal)and Deir al-Zour, destroying 15 IS oil trucks, an excavator, a piece of oil processing equipment, 14 oil storage tanks, two fuel trailers, an well head, a piece of oil processing equipment, and an IS headquarters. Full report on CJTF-OIR strikes conducted in both Syria & Iraq can be found here. Islamic State’s fighters clashed with tribal/militia elements loyal to the Afghan government, at the outskirts of Tora Bora, Nangarhar province. Clashes reportedly resulted in death of two tribal/militia fighters. Islamic State’s improvised explosive device allegedly destroyed a vehicle carrying members of Afghan National Police in the city of Khost, Khost province. Yesterday, two Islamic State’s improvised explosive devices targeted Al-Kharuba checkpoint, east of Arish. The explosion reportedly destroyed Egyptian Army’s tank and another vehicle.